I LOVE opportunities like this! A chance to thank so many people for their help, and so many more for their interest and support. Three weeks ago I wrote to you about the launch of our “Healthcare Hashtag Project“. An effort to bring greater order and discovery to the many healthcare conversations taking place on Twitter every day. The response was overwhelming, and we received a number of suggestions from which we’ve published several new additions to the hashtag list. So here’s a HUGE Thank You to all who have helped to organize, to visit, and above all share what we hope will be a resource to encourage physicians and other health / medical professionals to explore this rapidly evolving form of healthcare social media. Twitter hashtags, including those relevant to the healthcare industry, help to organize conversations on specific topics in the “twittersphere” … and “yes”, that is an actual word. I checked :-). So I continue to invite and encourage your input. We vet every suggested hashtag by investigating it’s use both in terms of frequency and purpose. Currently we’re only publishing those hashtags that are relevant to the “business side” of healthcare. However, as has been stated earlier, we do plan on rolling out a disease/patient centered set of hashtags in an upcoming phase. So keep those suggestions coming! Some Twitter conversations are a little more active than others. A little more formal. And a little more organized. These conversations take place not via random tweets that just share a common hashtag, but are scheduled to take place on specific days, and between specific hours. Dozens, even hundreds of people log on to their Twitter accounts at the prearranged time, and by attaching the agreed upon hashtag to each of their tweets they share ideas, reactions and observations with all the others who are participating in the same LIVE conversation. These conversations have become known, appropriately, as “Tweet Chats“. There are a number of services out there that allow for easy, chronological following of a Tweet Chat in session. Our own recommendation is www.tweetchat.com. It’s a simple, straight forward interface that’s built specific for the Tweet Chat conversation. Just enter the chat session’s hashtag and it’s like being in a virtual chat room. Most Tweet Chats have a common format. For example, they often have a moderator who keeps the conversation on track both from a subject and time standpoint. They also have prearranged topics, usually three or four, that the moderator introduces at varying points in the conversation so as to give equal time to each before the formal time constraints of the chat are exceeded. What topics have related Tweet Chats? What are the hashtags used for each chat? When are the Tweet Chats scheduled to take place? As of today, the Healthcare Hashtag Project attempts to answer those questions by moving into a second phase of its development. One in which we introduce you to the many topical conversations taking place on a scheduled basis. A current listing of known Healthcare Tweet Chat topics and their hashtags. An interactive, Master Calendar powered by Google showing the schedule of the health related chats. The ability to download the health and medical Tweet Chat schedule to your own calendar when you subscribe. More details about the healthcare chat when you click on one of the calendar entries. We’re also “handing the keys” over to each Healthcare Tweet Chat moderator so that they can make modifications to details about the chat as necessary, and easily communicate such with their respective communities. And that’s not all. 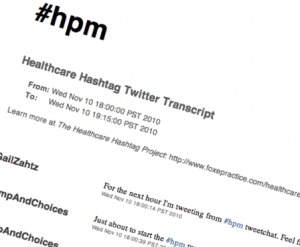 Go to a Tweet Chat’s hashtag on our Healthcare Hastag page, and there you’ll not only find details about the chat, but you’ll find the ability to selectively choose a chat date and time, and get a transcript of the session … with each entry in the same chronological order in which the live conversation flowed. Here’s an example of a transcript for last week’s #hpm chat moderated by @ctsinclair. Permanently archived tweets that can be called up on demand. So once again I invite you to come explore the Healthcare Hashtag Project. Please provide us with feedback on how we can help better meet the needs of current and prospective Twitter users who have a passion related to health and medicine, how we can facilitate the removal of barriers so as to encourage greater participation, and how we can demonstrate that a “web presence” is so much more than just a website. Make sure to also take a look at hashtags for healthcare conferences! Spends days connecting dots in healthcare social media. Co-founder of Symplur and The Healthcare Hashtag Project. Curious by nature. What do you get when you combine the world's largest database of social healthcare conversations with the world's largest database of healthcare influencers and power it all by machine learning? The most fun and effortless path to understanding healthcare social media. Symplur Signals is used by pharma, medical device companies, governments and research institutions.